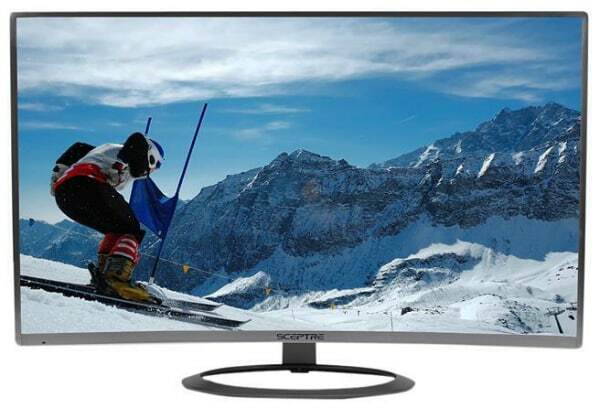 The Sceptre C325W is one of the cheapest display products available that is suitable for home or office use and multimedia consumption. It’s also great as an entry-level display for a relaxing gaming session with your gaming console while sitting on a couch or a lazy boy. The Sceptre C325W comes from a less-popular brand that makes affordable alternatives, so we know the first question you would ask is if it can go toe to toe with the big boys. The Sceptre C325W sports a clean and sophisticated look with its slim proportions and 1800r curvature. The chassis comes in matte silver which, to be honest, is an attractive alternative to the sea of black monitors we see every day. The display area isn’t bezel-free, but the dual stage design minimizes the panel borders on three sides. We like that the brand designed the Sceptre C325W to have a shallow side profile which should be good for your choice of placement. You can push the screen closer to a wall for more space on your desktop for peripherals such as keyboards with wrist rests. It’s also easy to wall mount the chassis since its thin and light at more or less 11 pounds without the included stand. Build quality is reasonable for a budget monitor since the device feels solid despite having thin plastic panels for the most part. We did notice a few gaps in the seams of the bezel and the rear cover, but that shouldn’t affect performance. There is a slight wobble if you the Sceptre C325W is knocked with a bit of force, but it stands steady otherwise. The most significant physical limitation of the Sceptre C325W is its tilt-only stand which looks similar to what Asus MX monitors have. The oval shaped base consumes minimal space since its hollow so that you can place small items such as thumb drives in the middle. For better comfort and usability, we recommend getting an affordable monitor arm if you are going to use this device on a desk. Connectivity is also good on the Sceptre C325W, although we’re used to seeing more connections on other 1080p monitors in the market. You get a DisplayPort 1.2 slot and HDMI 1.4 slot for primary video inputs and a VGA port for older devices. The monitor doesn’t have speakers, but there are 3.5mm jacks for audio in and out. 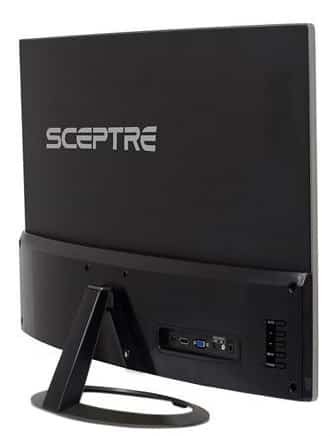 The Sceptre C325W features a 32-inch curved VA panel with a 1920 x 1080 resolution, 75Hz refresh rate, and 5ms response time. Sceptre lists the backlight to max out at 311cd/m2 along with a 3000:1 contrast ratio that is expected from vertical alignment screens. This model doesn’t meet today’s 144Hz standard for gaming, but it’s a fair option for users who game on consoles on the side. The first quality you will notice on the Sceptre C325W is its low PPI screen which can make edges soft and tiny details disappear. 1080p displays are best viewed in 24-inch monitors, with 27-inch as the max setting. This type of device is best viewed from a short distance to avoid noticing the pixels and to help users perceive details and lines better. The Sceptre C325W can produce the full sRGB gamut with ease thanks to its VA panel’s excellent saturation levels. Accuracy is pretty decent out of the box with a Delta E average of only 2.7 which can be refined to DE .5 if you have a colorimeter. There is some noticeable banding in darker shades, but the low PPI is the bigger issue here. The monitor’s contrast ratio reaches up to a staggering 3500:1, but its gamma level needs a bit of tuning at its default 1.95. Black level is superb as expected, while the grayscale rendering presents no issues in any type of use. The screen’s whites also look a bit synthetic right out of the box, so tweaking the brightness and adjusting the RGB sliders is a must if you like the warmth of sRGB screens. The bad news is that the Sceptre C325W has poor panel uniformity which affects dark or full black images. There is some clouding on the upper and lower edges of the large screen. Watching movies or playing games with darker environments will make the issue noticeable, especially if you are using the monitor in the dark. Of course, this flaw could vary between unit to unit since no two panels are made equal. Color uniformity is affected, although it isn’t enough to consider this device a bad investment, especially if you bring its price into the formula. Deviances against the D65 reached as much as DE 3.2 on the upper corners, but most of the sections stayed within reasonable limits. The user’s sitting distance comes into play again since the issues mentioned are most visible if you are sitting two feet in front of the screen. Motion handling isn’t one of the strengths of the Sceptre C325W which has a slow pixel response time and a limited refresh rate. Fast-moving objects or swiping the mouse will reveal blurs which is too noticeable compared to the current gaming monitors we have. You can set the refresh rate up to 75Hz it does little to help with the trailing. The Sceptre C325W also doesn’t have FreeSync compatibility, so you can’t rely on VRR tech to solve stuttering issues. However, running games in 1080p are relatively easy even for entry-level GPUs, so the feature isn’t necessary. Input lag is a bit on the high side at 25ms which is fair for casual gaming, but competitive users should go for other established options such as the AOC C32G1. The Sceptre C325W is an affordable display considering its size and image quality output, but it’s a little short on features. The monitor doesn’t have FreeSync and a few creature comforts such as a fully adjustable stand, but that’s somehow forgivable due to the low price. What breaks the deal is the device’s poor performance for gaming due to the slow motion handling and higher input lag. The Sceptre C325W is a practical choice if you need an immersive screen for movies or any day to day task. Reading text can be a chore since due to the low PPI, but we think most basic users won’t be bothered by it. The Sceptre C325W has a superb price to inch-diagonal ratio, but it could use considerable improvements in its most crucial characteristics.